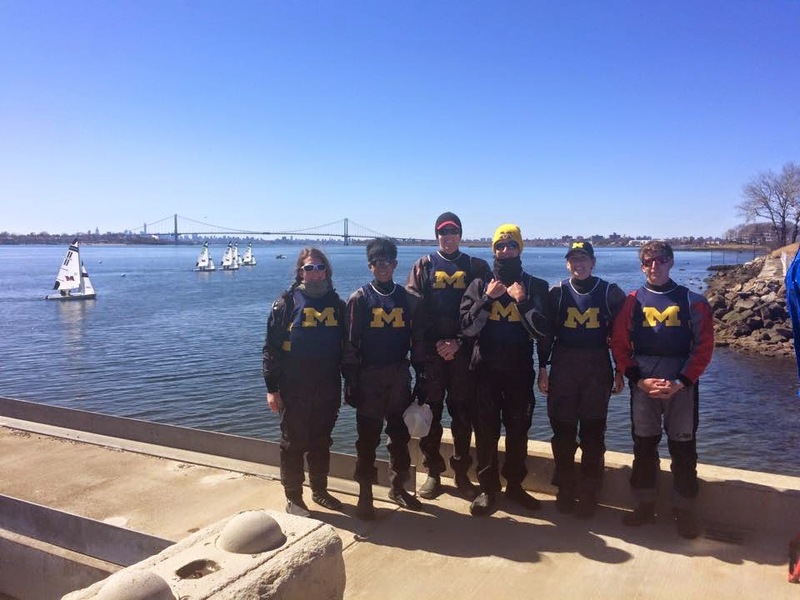 Six team members travelled to the east coast once again for another team race regatta last weekend! 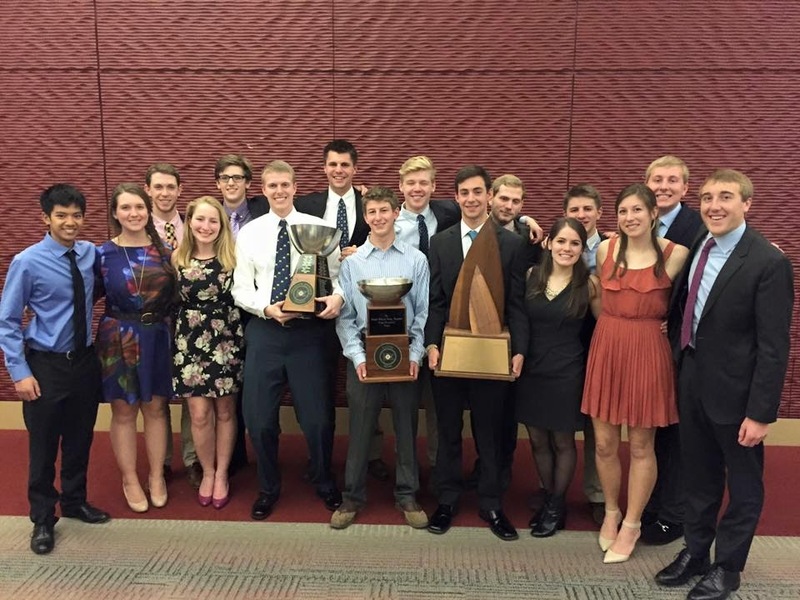 Alex Ramos, Thomas Etheridge, Chris Cyr, Mike Gapuz, Lane Tobin, and Sarah Sloan arrived at the Danilek's home in Stamford, CT shortly before 10 PM Friday night (a record-breaking arrival time for an intercollegiate regatta). They were treated to pizza and stories from Mr. and Mrs. Danilek's time on the team before going to bed to prepare for a full day of racing. Ten hours of sleep later, the team awoke to even colder temperatures and snow on the ground Sunday. But the Weather Gods were smiling down upon us and the sun was shining at SUNY. Six flights were sailed to finish the second round robin, the most exciting of which occurred between Michigan and UC Santa Barbara. Immediately before the start, the wind died almost completely. The current was working against us and thankfully Alex Ramos had enough foresight to maintain full speed the entire starting sequence, and crossed the starting line 15 seconds before the other five boats. The rest of the race was a thrilling combination of a spaced out fleet, missing marks, sailing upwind to reach marks, and quoting Awesome Aussie Skiffs to pass the time downwind. Michigan got the 1 and 2, but the real winner of the race was Ian from UCSB for getting a red flag for paddling around the upwind mark. Overall it was a successful weekend and we made it back to Ann Arbor before midnight. Thanks to the Danileks and SUNY Maritime for hosting! We're excited to introduce our newest t-shirt design! Perfect for game day and every day in between, this shirt is sure to be a classic. Visit our apparel page for ordering details! Boat-In was yesterday afternoon, and it's looking like we'll be sailing by next week! 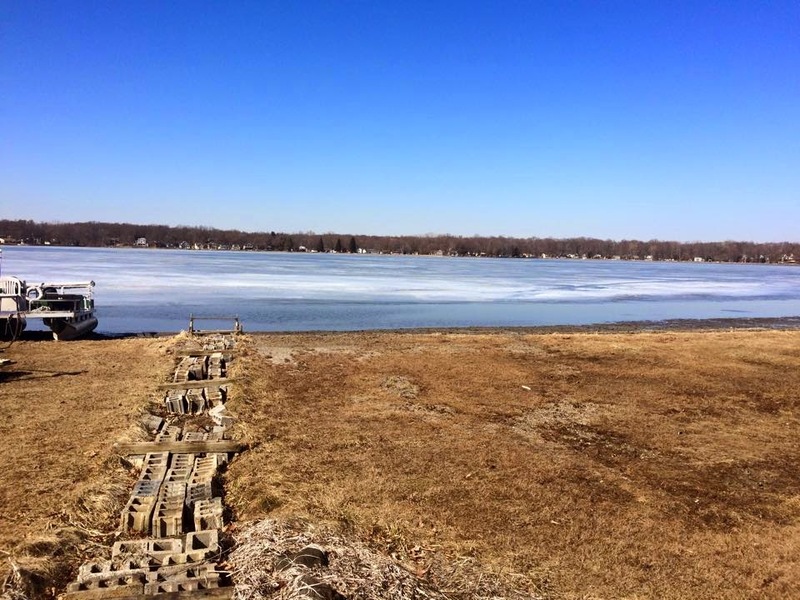 The ice was too thin to stand on according to the team's official ice thickness tester and resident lake expert, and there was open water near the shore and across the lake. 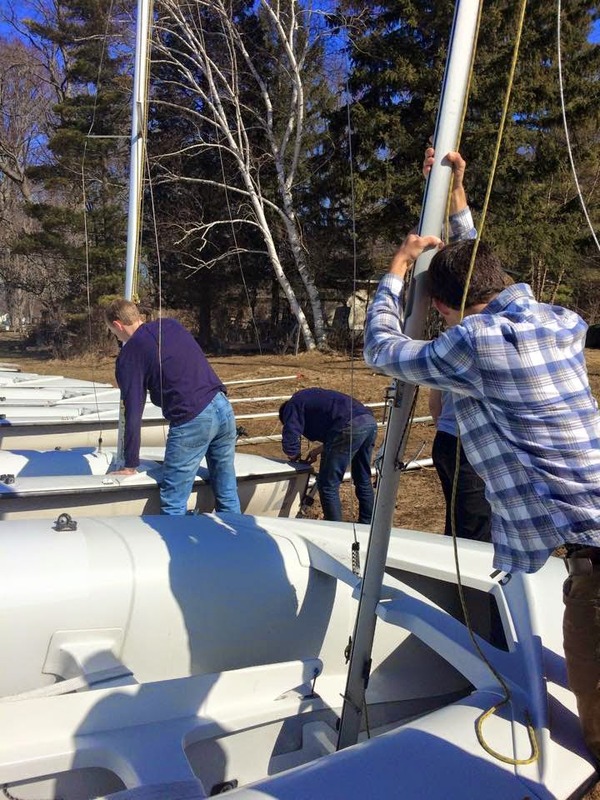 Team members moved 420s from the racks and stepped masts in preparation for practice and the Big 10 Team Race which we'll be hosting in two weeks. We're excited to see what the spring has in store! Chris Cyr, Thomas Etheridge, Alex Ramos, Mike Gapuz, Sydney Thompson, Emily Gazall, and Sarah Sloan drove to New London, CT last weekend for the Southern New England Team Race regatta. They arrived at their host's, the Lucentes, in Rhode Island shortly before midnight Friday. Racing was delayed until 2PM Saturday due to a ferocious snow storm, but the weather shifted 180 degrees and by 3 PM the sun was out, the snow was melting, and boats were in the water. The team sailed four races Saturday afternoon against Connecticut College, the Coast Guard Academy, Yale, and St. Mary's. They lost the first three races but improved each time, and beat St. Mary's in the last race of the day. 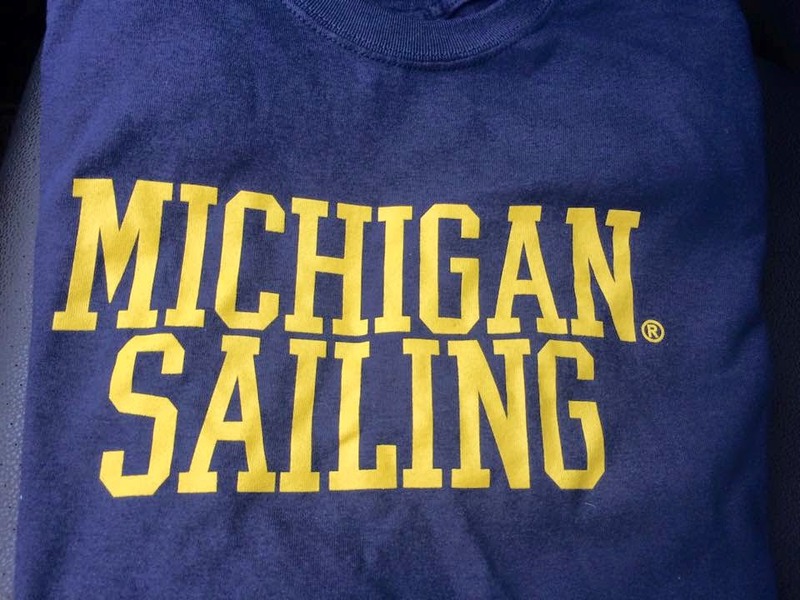 The regatta was called on Sunday due to cold temperatures and strong winds, and the team left Connecticut at 11 AM, making it back to Ann Arbor around 11:30 PM. Thanks to Conn College for hosting the regatta, the Lucentes for providing us with beds and meals, and Mike Gapuz for a never-ending stream of facts to keep the car ride interesting. 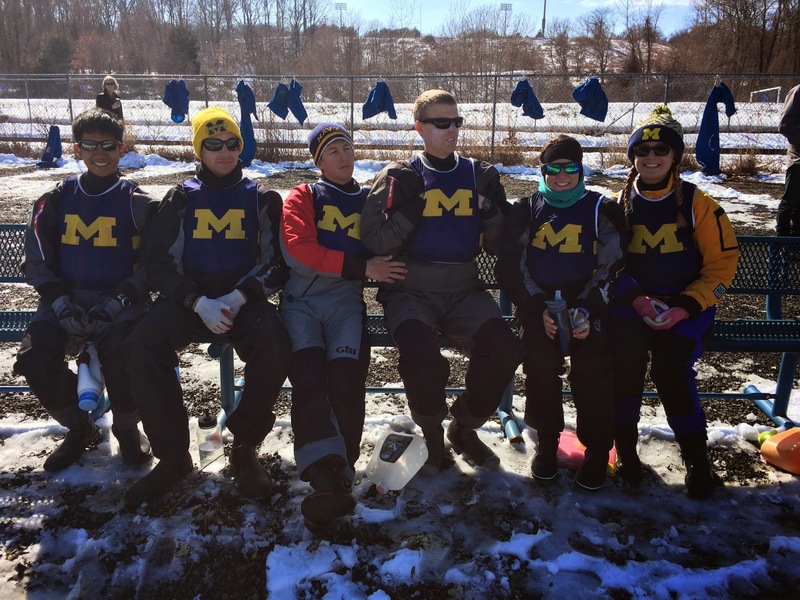 Our lovely freshman visited Notre Dame last weekend to sail in the infamous Freshman Icebreaker Regatta with other first-year sailors from across the MCSA. 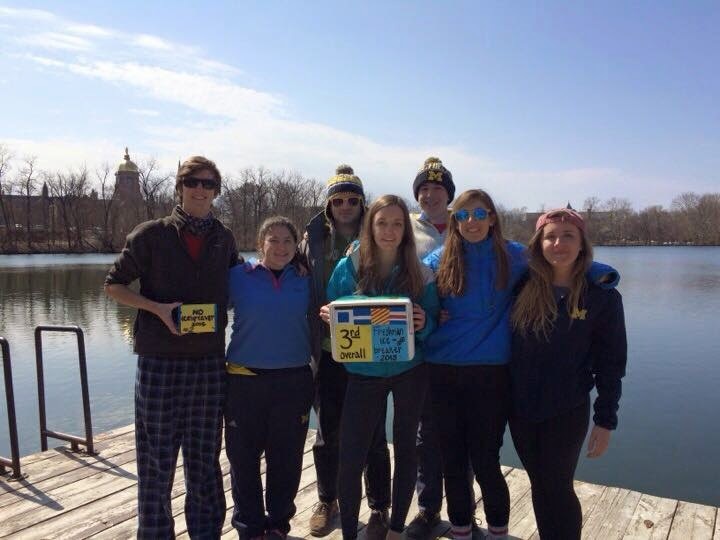 The regatta was a success, with the freshman taking third overall, and many friends were made. 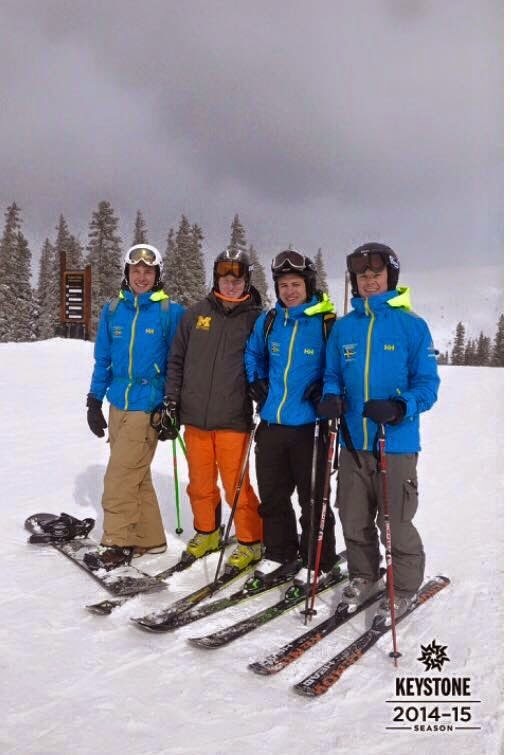 Not everyone on the team went south for Spring Break; five of our team members headed west to hit the slopes one last time before summer! The team returned from St. Petersburg, FL last weekend after spending at week at the University of South Florida's facilities to train. After placing 5th at the Frank Mendelblatt Team Race Regatta at USF at the beginning of the trip, the team was ready to keep sailing in the sunshine and work on boat handling team racing tactics. The team was on the water from 9-5 Monday through Friday. They focused on working on boat handling skills the first two days, and switched to racing mode for the second half of the week. The sun was shining and temperatures broke 70 degrees every day, and all team members were devastated to return home to cold weather and frozen lakes at the end of the week. Thank you to the Knoles family, USF, and our coach Andrew! Head over to our Facebook page to see pictures from the trip! Tom Etheridge, Alex Ramos, Emily Gazall, Meredith Wiles, Mason Wolters, and Sarah Sloan traveled south this past weekend for the first regatta of the season, Charleston Spring. The team left Ann Arbor at 10 AM on Friday morning and arrived shortly after midnight in Charleston. The team was thrilled to step out of the car and experience weather that was fifty degrees warmer than where they left (even though it was still only slightly above freezing). Racing was postponed Saturday morning at the College of Charleston Sailing Center due to lack of wind until 1 PM. The team spent the morning on the dock enjoying the 50 degree weather and carbo-loading on PB&Js until the fleet was finally sent out. The wind fluctuated between 3 and 6 knots over the course of the afternoon, and every team's heavy weight crews hunkered down for the long haul, as they were most certainly not going to be switched in. Racing was called off for the day at 4:30 after the wind died; four races were completed in the A and B divisions, with As sailing FJs and Bs sailing 420s. 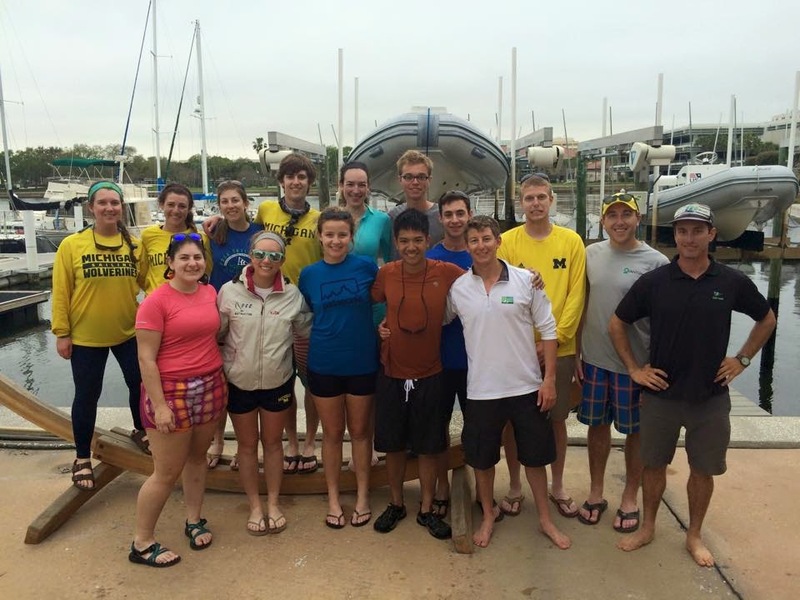 Michigan sat in 10th out of seventeen teams at the end of the day, and it was decided by team members that Mexican food was the perfect way to end the day after leaving the sailing center. Sunday saw stronger and more consistent winds, with speeds reaching a downright blustery 6 knots. Sailors left the dock shortly after 9 with As sailing 420s and Bs sailing FJs. The wind was incredibly shifty all day, keeping the RC boat busy with course changes. The sun and heat were out in full force, and our skippers and crews alike quickly abandoned spray pants and tops in order to better absorb the rays we've been so desperately missing. After the wind died at the gate for the final B race, racing was called for the day at 3 PM. We found our sea legs after three months off the water, and finished the weekend in 10th overall. The team got on the road shortly before 4 PM and arrived home in Ann Arbor at 6 AM, ready for a day of classes and eagerly looking forward to heading south again at the end of the week for our Spring Break training trip in St. Petersburg, FL. A huge thank you to the Verner family for hosting us over the weekend! Mark your calendars! 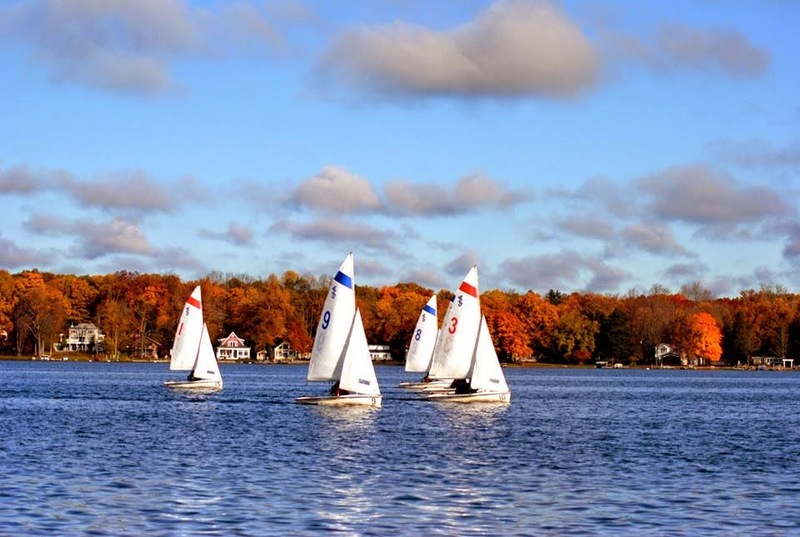 The alumni regatta is scheduled for September 20th, 2015. Come into town for the football game on Saturday, and stay for a great day of sailing on Baseline with new and old team members on Sunday! A huge thank you to everyone that stopped by our booth at Strictly Sail last weekend! It was another successful year, and we're excited to place new gear orders soon after selling out of two of our most popular designs! Captains Chris Cyr and Thomas Etheridge, as well as Race Chair DJ Litts, spent Saturday in meetings with the rest of the MCSA discussing team and conference goals for the upcoming season, as well as deciding regatta selection for the spring and fall. They joined the rest of the team later that evening at the UIC conference center for the annual MCSA Midwinters Banquet. Gearing Up for Strictly Sail! The team is getting ready to head to Chicago for the Strictly Sail Boat Show at McCormick Place! The show begins this Thursday, January 16th, and goes through Sunday, January 19th. We will be selling gear, including our new tech tees and hats, as well as old favorites (don't worry, we still have plenty of "Lucys" in stock). There will also be an alumni lunch on Saturday; if you're interested, contact Mitch Kimball at mdkimbal@umich.edu for more information! Tonight was the first meeting with the new executive board members of the 2015 sailing season! We're excited to have Tyler Davidson, Zach Nerod, Mitch Kimball, Lane Tobin, and DJ Litts to the board, and wish a fond farewell to outgoing seniors Ryan Davidson, Kendall Witmer, Katie Reid, Alex Ramos, and Liz Wallace. Check out the "Team Members" page to learn more about our new and incumbent board members!